Every Fall I get hooked on a salad and it’s not a mealsy one. Do you remember Fall Panzanellafrom last year? Well, this year, I am taking inspiration from Fall produce again and making The Ultimate Fall Salad. There are only few components in this salad but every one of them is carefully planned and mixed in so it can really stand to it’s name. I am talking made from scratch corn bread croutons (you don’t have to if you are short on time or just don’t want corn bread) paired with baby kale, sliced apples, pumpkin spice pepitas, roasted delicata squash rings, roasted beets, and pumpkin vinaigrette. 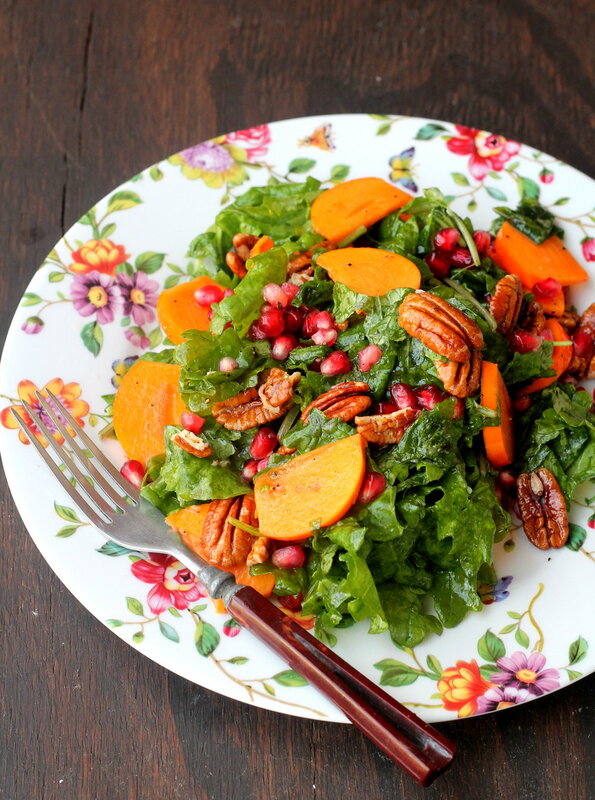 The Ultimate Fall salad is simple, hearty, & satisfying to help you get your greens and seasonal produce this autumn. As we move deeper into Fall/Winter season, it is completely natural to crave for more comforting & warm food and less raw recipes. Lately, I have been diving into Ayurveda and learning about different doshas (energies believed to circulate in the body and govern physiological activity). Fall is called 'vata' season - it's cool, dry, rough and light so it is suggested that we eat food that neutralize these qualities. Food that are warm, moist, oily, smooth, and nourishing are recommended to help keep our energy grounded. The world of Ayurveda is not completely new to me because I grew up listening and following some of the practices but now that I am beginning to understand the why, what, and hows and it does make a lot of sense. I will probably share a thing or two as I learn more but for now, can we talk about Pumpkin Vinaigrette from Sprouts? You know I am your basic vinaigrette girl for all my salad needs but I am head over heels over this pumpkin vinaigrette/marinade. It has a subtle pumpkin taste with just the right amount of tanginess so it works for both pumpkin & non-pumpkin individuals. 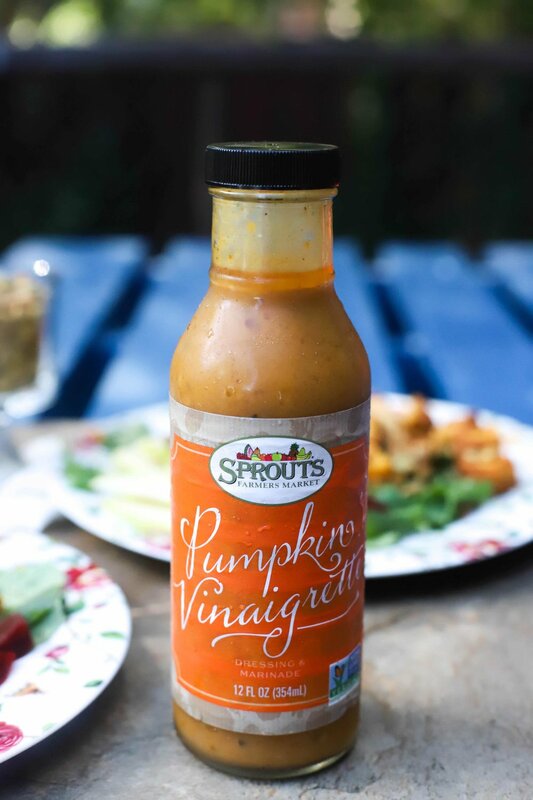 On my post on "5 Things I Learned About Sprouts", shared about Sprouts in-house brands that are working constantly bring new products to the customers....and the pumpkin vinaigrette I am using in The Ultimate Fall Salad is the store-brand. I hope you will check it out and give it a try next time you are at Sprouts!! If you are absolutely against the idea of pumpkin vinaigrette, you can most definitely try a basic vinaigrette and that will be delicious too. Also, if you are new to the world of salads, you will find 7 Tips For Building a Better Salad to be resourceful. When I am assembling a salad, I always think of balancing textures + taste and embrace the idea of less is more. I'd rather fully enjoy few components in my plate rather than a haphazard mixture of ingredients. 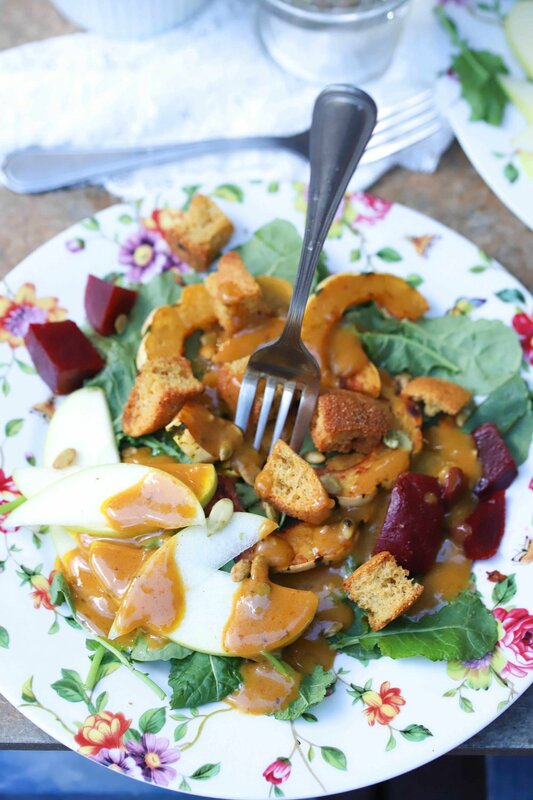 The Ultimate Fall Salad has crunchiness from corn bread croutons, pumpkin spice pepitas, and sliced apples while roasted veggies like delicata squash and beets provides softness. Baby kale adds a mild peppery flavor and the pumpkin vinaigrette balances and brings together everything with it's sweet, tangy flavor. It's literally Fall in every bite. The Ultimate Fall Salad comes together effortlessly like most salad as it requires simple preparation and assembling. I simply roasted vegetables, plated everything, and drizzled the pumpkin vinaigrette right before serving. I like roasted vegetables straight out of the oven when possible but for The Ultimate Fall Salad, both warm or cold roasted vegetables works great. If you are packing this for lunch, I'd suggest not mixing the pumpkin vinaigrette ahead of time because it makes kale get little soggy. I hope you will give The Ultimate Fall Salad a try soon or make it part of your Thanksgiving/Friendsgiving table! I am sharing a rough recipe below that will make enough salad for 2 people but feel free to swap your root veggies, greens, and other ingredients per your taste. Line a baking sheet with parchment paper and arrange delicata squash rings & beets. Roast stirring once until tender and slightly brown on delicata squash. The vegetables should be tender but not mushy. In a plate, arrange baby kale and top with roasted veggies, apple slices, pumpkin spice pepitas and drizzle pumpkin vinaigrette. For corn bread croutons, I make corn bread and sliced them into chunks and baked in the oven for 8-10 minutes until crunchy. You can use leftover corn bread, use store-bought corn bread croutons or use regular croutons! Pin The Ultimate Fall Salad or if you try it, I'd love for you to share your creation and tag @foodpleasurehealth on instagram!